Sicily is well known for its arancini and granita, neither of which we got to sample while we were there. We found one gelataria that had granita, but they looked awful – not even the coffee flavoured one enticed me. I decided that I would make my own and chose a watermelon granita as my flavour to experiment with. I have a juicer which would get more use if I had the space, but it was well worth getting down to juice the watermelon. You could purée your watermelon and then pass it through a sieve if you don’t have a juicer. I used the left over watermelon to quench my thirst, and I used the granita to make a vodka cocktail for a hot afternoon cool me down drink. Have you made your own granita, or tasted some and which flavour do you like best? we’ve never tried a granita. this watermelon one is fantastic! I have a bunch of frozen watermelon and I think this would be great to use it up for this! Nice. Saving this recipe for the summer! I only ever tried apple granita & loved it too so I bet that I will love this version too,…looks great & refreshing! Yummm . i just didn’t understand why granita and shorbets is pretty pricey in the restourant??? I love lemon granita the best, especially in Italy! If only I didn’t live so far away. I cannot wait for watermelon to come back into season here—so trying this! I love the combination of the watermelon and orange juice. Great recipe, Thanks! Thank you Tandy! I’ll look forward to making this. This looks so refreshing Tandy. Another great recipe! 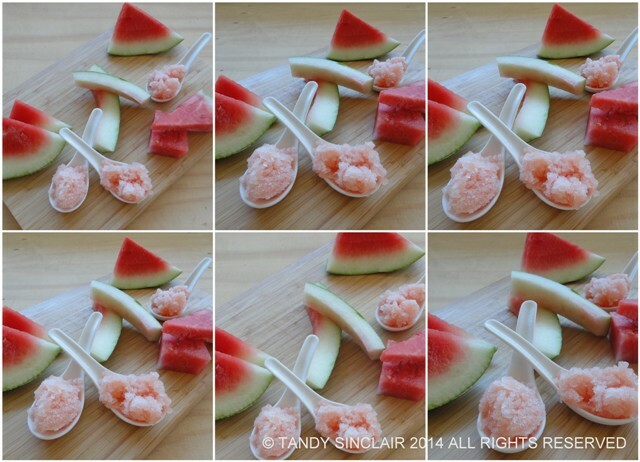 Oh Tandy, how I LOVE watermelon granita! It’s been really really hot here too, I think you are the same, no? Thankfully we have not had temperatures as hot as you have had, but our heat wave season is only starting! I love granita and sorbets but I have never made one with the addition of orange juice, how delicious… I will have to try it, I love watermelon in everything! The ideal treat for the insanely hot weather today. Actually it might be too hot to make so I’ll just dive straight into the ice cold watermelon! I saw a watermelon granita recipe somewhere in a vegan dessert cookbook, involving chocolate as the “seeds.” What a lovely Sicilian dish, I can’t wait for sunshine to come out and Sicily is one of the destinations on my travel wish list. This is such a refreshing treat! 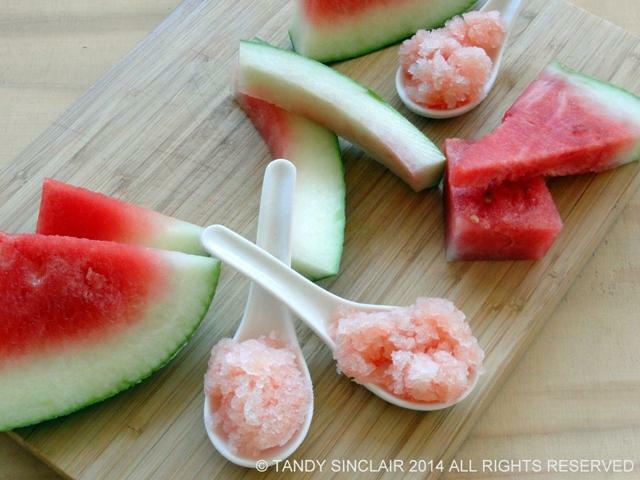 I love watermelon on a hot summers day and bet I would love your granita even more. Ooh that sounds good and looks so pretty too. When summer comes round in Spain I’ll be making it!